With solar energy heating, your pool will be able to get a return on your investment as you are using a renewable, and free resource. Though the upfront cost can vary depending on the size of solar system you would need, the heating system could pay for itself in 2-7 years with the energy costs you are saving. The US Department of Energy says that a gas pool heater will cost around $2500 or more per year, depending on where you live. Additionally, they say that you save 50-80% per month compared to using a gas or electric (not solar) water heater. And since the sun is free you don’t have to worry about the price of gas or electric power going up. A solar heated pool will extend your swim season up to 10 months of the year. This means more family outdoor time or being able to host your child’s much-wanted pool party in the colder months at your home, instead of at the local indoor pool. And it is much more fun to swim in your private pool in central Florida, than at a public one. If you enjoy swimming for exercise purposes it also means saving more on gym memberships as you can use your own pool more throughout the year. 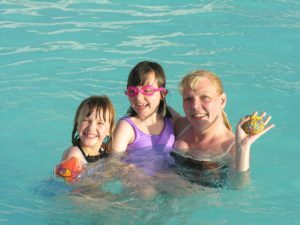 Water aerobics and exercise is great for full body workouts. It provides low impact and minimal stress on joints and keeps you in great shape. Extending your pool use helps to keep you living a healthy lifestyle. Solar energy is abundant and renewable meaning this is a great way to go green while saving money. It is the most energy efficient way to heat a pool according to the Department of Energy. In our fragile ecosystem near Central Florida, we really should take more care of nature. Solar pool heaters, in most cases, operate on the existing pool pump, therefore no extra costs are associated with heating your pool. Solar heating requires minimal maintenance to maintain efficiency compared to gas or electric which needs yearly technician services. Solar pool heating will leave you more time to enjoy your pool instead of maintaining its equipment. Solar pool heating systems are usually much quieter than other heating systems giving you a more relaxing environment without the hum of extra machinery around you. Our solar pool heaters come with a 12-year parts and labor warranty and can last 20+ years as opposed to costly electric or fuel heaters with much shorter life expectancies. We also warranty all roof solar penetrations free from water intrusion for the life of the solar system. The Sunstar solar pool heaters are a patented individual tube design, with adjustable mounting hardware, engineered to align roof penetrations with the truss system on your home. The water from your pool is pumped, usually using your existing pool pump, through a filter and into the solar collectors. While traveling through the solar collectors the water is heated using the energy the collectors have gathered from the sun. The heated water is then directed back into the pool providing you with the perfect swimming temperature. 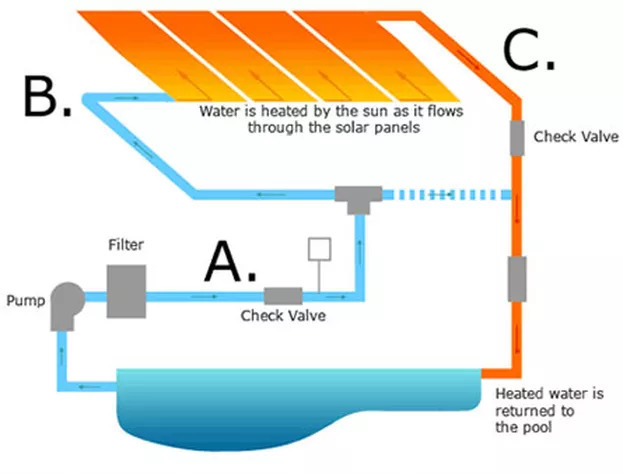 Below is an illustration of how the solar pool heating system works. 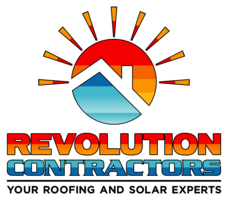 Revolution Contractors Roofing and Solar, LLC proudly offers Sunstar Solar Pool Heating Systems. 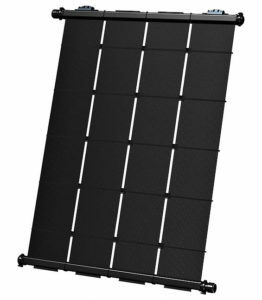 The Sunstar solar pool heaters are a patented individual tube design, with adjustable mounting hardware, engineered to align roof penetrations with the truss system on your home. An optional automatic thermostat control can be installed to regulate your water temperature at your desired temperature. Just set it and forget it! Quality is our #1 priority, each system is designed, installed, and plumbed with close attention to roof protection and aesthetics. We stand behind our work! 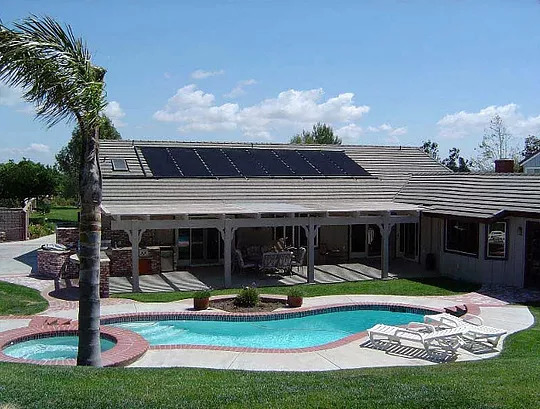 When getting your solar pool heating system there are several things to take into consideration to determine the size of the system you will need. We will gather this information in order to meet your heating needs and help create an estimate for your solar heater. The size of your pool will help determine how many solar collectors are needed to heat your pool effectively. The solar collectors generally equal about 50-100% of the pools surface area. If you want year-round use of your pool more solar collectors may be needed to help achieve this. Other factors may affect this as well such as the area in which you live and the abundance of sunlight that is available. The temperature you want your pool water to be will affect the size of your solar heater system. Higher temperatures may mean more solar collectors to meet your needs and keep you in the pool longer. When using solar heating the placement of the collectors is important. Placing them in order to get optimal sunlight is key. The mounting placement, the direction they are facing, and the tilt of the solar collectors could affect the efficiency of your heating system. We use this information and several other things (such as average temperature for the area) to help us find the size of the solar heating system that will meet your expectations. We are happy to answer any questions you have concerning how we determine the size of solar pool heaters. Please give us a call for a free estimate today! Pro Tip: If you want to get the most out of your solar pool heaters use a pool cover when the pool is not in use. This helps keep the heat in the water and not evaporating into the air!